I love Christmas; the decorating, eating great food, buying/ making gifts, time off with family, cold weather and fires but I love Christmas for it's true message. I always try each year to start telling the kids the Christmas story early so that they know Christmas is about Jesus being born rather than just about them getting presents and so buy as many nativity related things that I see and find in order to make it fun. I bought a lovely 3D nativity puzzle from M&S 2 years ago and a gift set of a book with paper figures and a stable which we got out this week and completed. 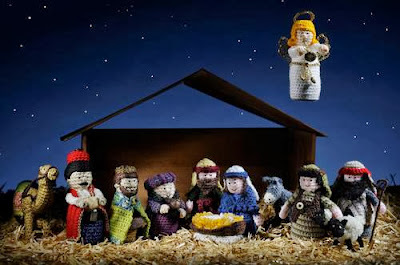 I am going to try and post all things Nativity related in the lead up to Christmas including the things I make which follow this theme. I had a little look on ebay and etsy etc to see what a knitted/ crochet set would cost me and they seem to be approx £25 which isn't bad for all the time someone would take to create them but I can't justify it at the moment and thus, I have begun to create my own. Not being the best knitter or crochet chic however, I have decided to sew mine and am going to use a very eclectic mix of fabric to make it totally unique! Here's the first of my wise men.